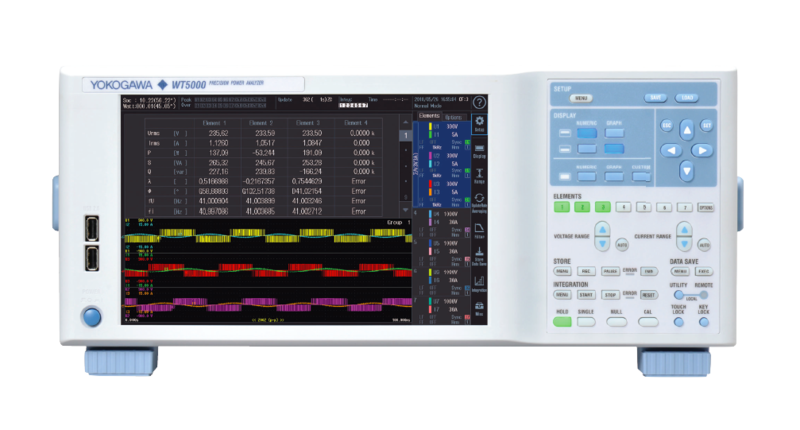 When measuring input signals of distorted waves, signals that are DC-offset or signals that include superimposed harmonic components, will result in different values for power factor and phase angle than those expected with sine waves. Therefore, the power factor and phase angle of input signals of distorted, DC-offset, or superimposed harmonic component inclusive waves will differ from the power factor and phase angle of the fundamental wave. Also, on other measuring instruments, the measuring or calculation method may differ from that of the WT, so the power factor and phase angle values may also differ. Additionally, for a power factor close to 0 (phase angle of voltage and current is close to 90°), slight measurement error in the measured values of voltage, current, and power will affect the power factor and phase angle values. Check that the measuring range is set appropriately, and check that the calculation error attributable to the error in voltage, current, and power is within that range. Therefore, the source of error in the Σapparent power value is the source of error in the value of Σpower factor or Σphase angle. The power factor (value calculated as active power/apparent power) in the case of a distorted waveform is called the total power factor. The apparent power increases with distortion of the waveform, and the power factor (calculated value) becomes less accurate. "Phase compensation" (or "power-factor improvement") can be thought to mean, in addition to resolving phase differences in the voltage and current, improving the waveform distortion.